This is a rectangular Player’s Tobacco and Cigarettes porcelain sign. This particular Player’s Tobacco and Cigarettes sign is white with red and black text. 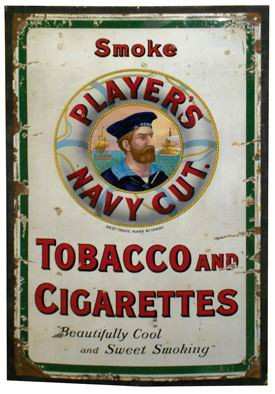 It reads, “Smoke Player’s Navy Cut Tobacco and Cigarettes, Beautifully Cool and Sweet Smoking” and features a sailor framed with a life preserver ring in the center of the sign.